To shoot HDR videos with iPhone 4, there is a an impressive photography app named Flare by greenlike, worth $0.99 and available on App Store. From the creators of the world’s first true HDR video, featuring real-time shadow enhancement and that HDR look you won’t find anywhere else. Uses the algorithm developed for the first HDR video demonstration using DSLR’s. (A million views in a day and top 50 most liked video on Vimeo!). 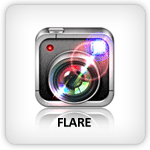 Flare is compatible for iPhone 4, 3GS, iPod touch 4G, iPad 2 Wi-Fi, and iPad 2 Wi-Fi + 3G and requires iOS 4.1 or later. You can download Flare app through App Store.